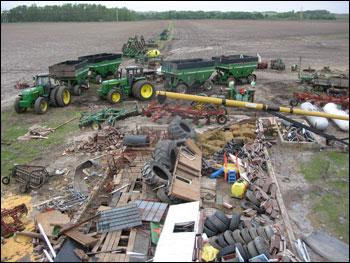 Sunday, May 25, 10 p.m.
Today (Sunday, May 25) during all this bad weather one of the tornadoes went north of Waterloo and into Dunkerton. On its way it got part of Dave and Cindy Schake’s home. The machine shed and garage are completely gone. No sign of any equipment that was in the machine shed. Two boats are totally gone. The trailers they were sitting on are down the road a bit. Everything else is gone. The garage that Dave had his restored car in, along with a truck, is gone. Both vehicles were lifted and something is underneath them and rear tires are not on the ground. We will investigate that tomorrow. The house had all of it windows on the west side of the house blown in and you can’t believe all the dirt and debris that was blown in. It appears that the ceiling of the entire house was literally lifted off the walls and then dropped back down. Dirt is everywhere. Broken glass is everywhere. It got dark just as we were getting tarps over all the windows and the holes in the roof so we didn’t get much more accomplished outside. A large number of you [church family] tried to get to Dave’s house but law enforcement shut down all roads going into that area. In the quarter-mile leading up to Dave’s house there were four lines down across the road. There was also a propane tank leak that had to be fixed before they would open the road. As of 10:30 tonight they had moved the wires off the road and it was drivable but the sheriff still had it closed. We are hoping that in the morning it will be open. Thanks so much for trying. Outside–The plan is to start at about 9 am going thru “stuff” in yard and where shed and garage used to be to sift out what is still good. Inside– they will try to pack up those things that are still good and move them to the basement or to the attached garage. There might be a possibility that storage sheds will be rented. It was suggested that for those that come we will be cleaning up the glass that is everywhere in the house and in the yard. Rakes, wheelbarrows and scoop shovels would be helpful. We have plastic over the windows at this time. We may want to put tarps up (more heavy duty) or plywood. They are going to stay in the house at this time. There is no electricity. Power lines are down all the way down the road. They have a generator. Monday May 26th 9:00 a.m.
We just got home from helping all day. There were about 45 people who showed up to help. We removed and burned debris, raked up glass, boarded up broken windows, helped his elderly neighbor across the road with some of the same. The tornado lifted their roof off their house and then set it back down. We could not believe the devastation. Dave is always helping others, so today it is our turn to help him. Their home is lovely and not very old so not sure what they will do. Wednesday May 28th 6:00 p.m.
Around 40 people, including about 20-25 youth and leaders, met at the home of David and Cindy Schake last night to pray for them and all of the neighbors in their area that were hit by the tornado. It was a precious time of lifting up our praises and prayer requests to our Lord and Savior. Pastor Ken Matteson (Youth Pastor), Pastor Kelvin Cooke (Senior Pastor and his wife) the youth leaders, and the youth passed out about 50 fried chicken meals and bottles of water to David and Cindy’s neighbors in a several-mile radius around them and crews working on power lines all over the area. They were able to pray with some of them also and invite them to church. One family we gave meals to and prayed with said we were God’s angels sent to them and that they really appreciated the meal since they had not been able to cook for a few days. Pray that God will bring many blessings out of this disaster and that His name will be praised and glorified because He is good all the time!